Create a trendy contemporary look with this glossy white 36" x 48" diameter dining table. This piece features a sleek chrome metal base and a smooth surface ideal for dining, drinks and tapas. This table is great for dining and entertaining guest especially in smaller spaces. great for dining and entertaining guest especially in smaller spaces. Perfect for sharing in an intimate dinner for two or four, the Utopia Square Dining Table is a classy focal point for any dining area or kitchen. Beautifully crafted two-tone splayed wood legs, keep this piece durable and stylish. Select a glossy marble finish or creamy off-white tone for a seamlessly sophisticated look that will instantly transform your space. Get ready to bring a wow factor to your dining space with this bold, modern rectangular dining table. While the one inch thick table top has a warm dark taupe wood-look finish, it contrasts beautifully with an edgy chrome apron and sturdy square metal legs. This versatile table comfortably seats up to 4 people for fun get-togethers in a formal or casual dining room or kitchen setting. The compact size will bring a room to life in small homes, apartments, or condos. Chairs are sold separately. Timeless appeal, clean lines and this simple contemporary design are the key elements of this dining set. Featuring a solid wood table top with sleek square tapered legs finished in a deep cappuccino, and a convenient 12" butterfly leaf, this set is quality built and will blend with most styles of decor. Dining Table - 36"X 48" / White Glossy / Chrome Metal Create a trendy contemporary look with this glossy white 36" x 48" diameter dining table. This piece features a sleek chrome metal base and a smooth surface ideal for dining, drinks and tapas. 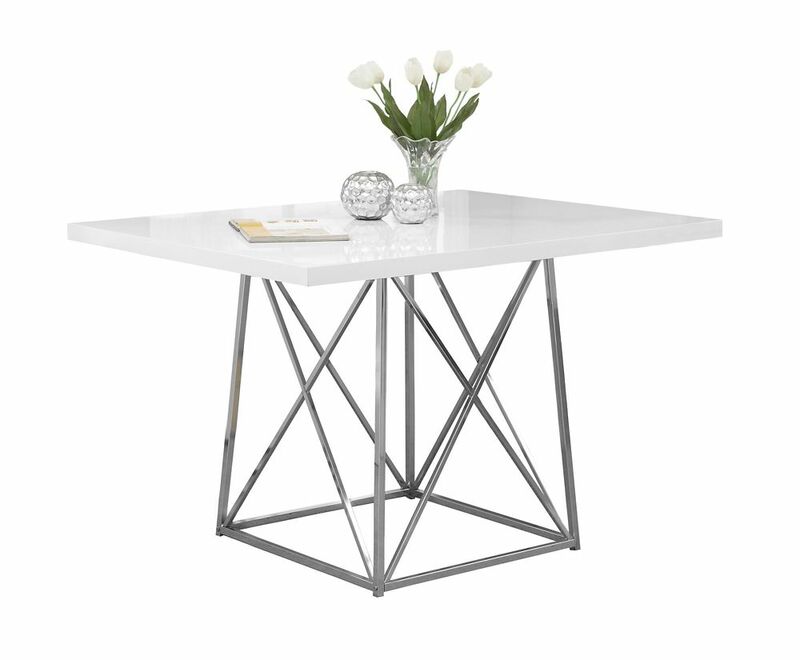 This table is great for dining and entertaining guest especially in smaller spaces.